These beautiful squashes burst out of dirt hill where I had planted a type of heirloom pumpkin. My guess is that they grew from a volunteer seed in the compost pile, which is an occurrence I love – having surprises pop up in the garden from the compost is really fun. In the past I’ve gotten melons, different kinds of tomatoes and pumpkins, all from the germinated seeds that ended up in the soil when I mixed in compost. 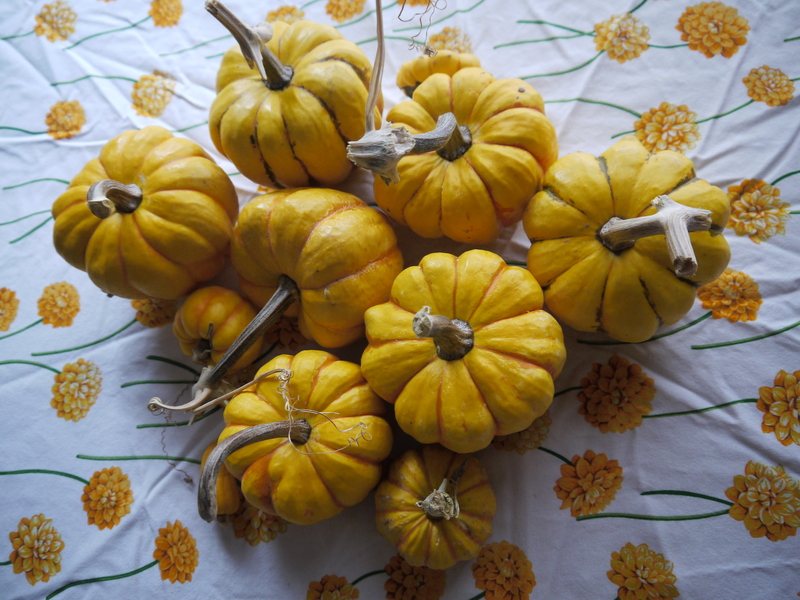 Now we have these beautiful carnival squash which have been stored in the garage through the winter, allowing us to enjoy them stuffed for dinner. 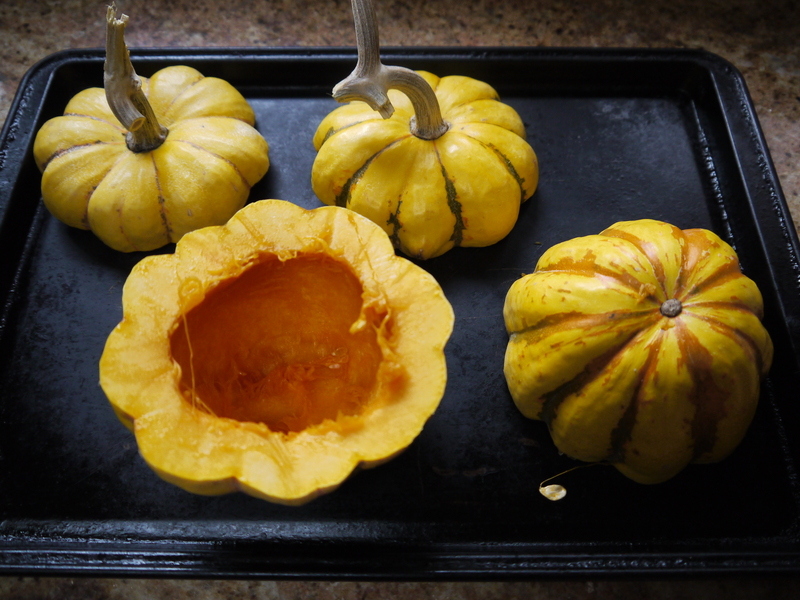 Cut a lid from each squash and scrape out all seeds. 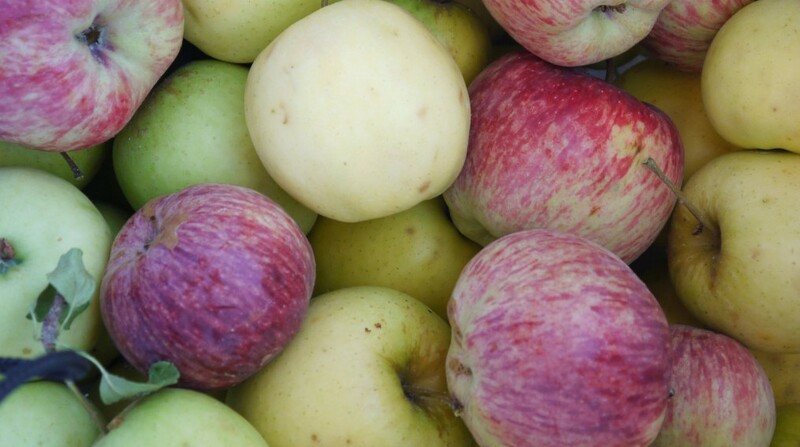 Save some, if you like, for planting in your garden. Place the squashes cut side down on a sheet tray and bake in the oven until easily pierced with a knife, about 45 minutes to 1 hour. While the squash bakes, get the filling going. Heat the oil in a 12″ frying pan over medium high heat. Add the bell pepper, onion and garlic and sauté until soft, 7-10 minutes. Add the ground turkey and break up with a wooden spoon, stirring and cooking until meat is not long pink. Add the rest of the ingredients, mixing well and simmer until thickened, about 10-15 minutes. 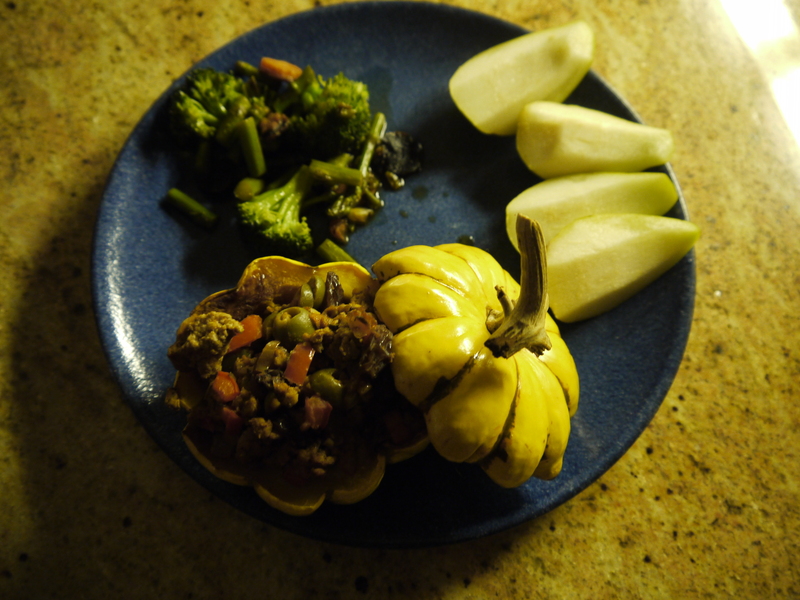 Fill each squash cup with the picadillo and sprinkle the top with almonds. Put the lid on top at a jaunty angle and serve.